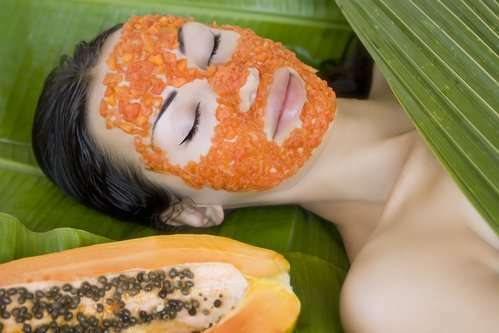 Papaya is a beta-carotene-rich food packed with potent healing enzymes and phytochemicals that makes it a great choice for making extremely beneficial facemasks. The papaya enzyme mask has ability to fight free radicals, which in turn slow down the formation of fine lines and wrinkles, even if you’re frequently exposed to the sun. The key nutrient in papaya is papain, a powerful enzyme that has skin-lightening abilities and has power to heal irritated and sunburned skin. Papaya contains hydroxy acids, which together with papain works as a gentle exfoliator that can get your skin rid of inactive protein and dead skin cells. Applying papaya topically to skin will reduce the appearance of blemishes and acne scars, leaving your skin smooth and supple. Vitamin A Nurses dry, flaky skin. Diminishes appearance of blemishes and dark spots. Delays skin aging. Vitamin C Improves skin elasticity and firmness by boosting collagen production. Papain Helps remove dead skin cells, bolsters skin regeneration and provides healthy-looking skin. Has anti-inflammatory characteristics, which help heal skin disorders such as acne, rosacea, and eczema. Exfoliates skin. Brightens dull skin and lessens skin pigmentation. Works as a skin softener that evens out rough skin tone and calms acne. Alpha hydroxy acids Exfoliate skin; thereby help you get a youthful glow on your skin. Potassium Hydrates and moisturizes dull, dry skin. 1. Skin-Whitening Papaya, Honey, and Lemon Face Mask For Acne: Looking for a face mask to help you control your acne problem? This beauty recipe contains papaya, honey and lemon juice – these all have antibacterial qualities that will exterminate off acne-causing bacteria from the skin. Papaya also has a deep-cleansing effect that will shove out all the muck from the blocked pores. Honey has a unique moisturizing effect and works as a natural humectant, so it helps lock-in moisture to keep your skin hydrated. It exfoliates and softens skin gently. It has antibacterial properties, which ward off bacteria that cause acne. Also has abilities to reduce blemishes and even out discolorations. Lemon juice works as a natural astringent. It’s full of vitamin C and antioxidants that tighten large pores and rejuvenate your skin. It works to lighten skin, removes excess oil, kills off bacteria on the skin’s surface and fights acne. Bonus point is, it deep-cleanses pores, refreshes and softens skin. (i) Chop a quarter of ripe soft papaya into small pieces and put them into a blender. (ii) Add in a tablespoon of organic honey and 1/2 teaspoon of freshly squeezed lemon juice. (iii) Blend the mixture into a lump-free fine paste. If the papaya is soft and mushy, you can just mash it up using a fork instead of a blender. (iv) Wash your face and neck. Apply the face mask onto your clean face and neck. (vi) When the time is up, gently use warm water to loosen the pack. (vii) Finally, rinse off with cold water and pat dry your skin with a clean, soft towel. (i) Steam your face before applying the mask to open up the pores. This will let the face mask get into deep and nurture your skin cells. (ii) You can also use papaya peels as they are also beneficial for the skin. Just rub inside of the peels on your skin and rinse it off after a few minutes. (iii) You can apply this papaya face mask once or twice a week to enjoy glowing, beautiful skin. 2. Papaya, Banana And Cucumber Facial Mask To Hydrate Aging Skin And Lighten It As Well: It is a great facemask for getting a soothing and refreshing skin. Cucumber contains properties to hydrate, moisturize, nurture and cleanse skin. It also has skin lightening qualities, which help fade out blemishes and acne scars. Bonus point is it soothes sunburned and inflamed skin. Banana hydrates and softens rough skin. It not only exfoliates, but improves circulation as well, which will keep your skin soft and young. It is great at delaying aging process and reduces fine lines and wrinkles. Bonus point is that is that it makes your skin glowing and youthful. (i) Peel and blend all ingredients together in a blender until you have a lump-free, smooth puree. (ii) Slather the mask onto your face. Allow it to sit for about 15 minutes, until it dries out. (iii) When the time is up, first use warm water to loosen the face pack. (iv) Finally, use cold water to remove the pack thoroughly. Finish with pat drying your face dry with a clean, soft towel. (i) Steam your face before applying this mask to open up the pores. This will let the face mask get into deep and nurture your skin cells. (ii) Consider wearing an old t-shirt or an apron to avoid the mask from trickling down onto your clothes. (iii) Apply the mask over kitchen/bathroom sink to prevent your floor from getting messy. 3. DIY Pampering Papaya And Pineapple Face Mask For An Ideal Bleaching Action: Pineapple is packed with lots of bromelian enzyme that helps get rid of outer layers of skin to fade out age spots, fine lines and wrinkles. When combined with the enzymes, high levels of papain and natural alpha-hydroxy acids contained in papaya, what you get is a perfect recipe to get rid of dry, scaly skin to make your skin look fresh, smooth and spots-free. The other benefits are that this mask acts as a natural exfoliant and has a bleaching effect on the skin, thus it lightens skin color as well. Yay! (i) Juice papaya and pineapple in a juicer. Alternatively, mash the fruits together or blend them in a blender. Strain out the pulp with fine mesh strainer or cheesecloth. (ii) Gently wash your chest, neck and face with warm water. (iii) With the help of a cotton ball, apply the juice onto your chest, neck and face, avoiding the eye area as it stings. If you like, apply the juice at the backs of your hands also. (iv) Lie down and allow the magic to work for about 15 minutes. It may sting and itch. It’s normal and an indication that the AHAs is doing its job, so resist from scratching. (v) When time is up, rinse with warm water and moisturize. If you like, use coconut oil as a natural moisturizer. Natural Beauty Tip: You can apply this mask 1-2 times a week. waw nice info, thank’s for this information.. This was very interesting thank you. It helps for everyone To stay Young with Papaya.